Below are some of our most Frequently Asked Questions. If you need further information, please Contact Us. Where are you located? Please consult our Contact Us page. Do you take reservations? No we do not. Can we use your parking lot to go to the beach? Sorry, but no. Our parking lot is private and for use by our customers actually dining or having drinks (e.g., you cannot have lunch and then go to the beach, or vice versa). Please be considerate and leave parking places open for our guests. If you want to go to the beach on Captiva, down below is a map showing where the Public Beach Parking is located just over a half mile away. What time is sunset? Please consult our Sunset Times page. Can we anchor out off your beach and then come in to eat? Yes you may, but please call the restaurant at 239-472-3434 to let us know your intentions. How do I order T-shirts or other Mucky Duck merchandise? We do not have online ordering, so you need to either come by the restaurant or call us at 239-472-3434 and provide a credit card over the phone. We can usually ship it! How do I get a gift certificate? Same as above for merchandise – stop by or call. We can mail them! When do you have live music, and who is playing? Generally we have live music out on our patio every day from about 4pm-8pm. Please call the restaurant at 239-472-3434 to inquire about who is playing. Can we eat outside on the patio? Yes, however all food and drinks are self-service on the patio (there is no wait staff, so you must order food inside at the main bar. There is an outside bar for ordering drinks.) Our full lunch menu is available outside, but only appetizers may be taken outside for dinner. Do you allow dogs? We generally do allow well-behaved dogs outside on the patio, but reserve the right to revoke that privilege at our own discretion (as to non-service dogs). Do you serve liquor? No, as we have chosen for our own reasons not to obtain a full liquor license, but we do have a substantial selection of beer, wine, and delicious wine-based cocktails. Do you have a Happy Hour? No we do not. Where do I park if your parking lot is full? You can drop your passengers off, then go back out to Captiva Drive and make a left. Continue all the way to the end of Captiva Drive, where you will find a public parking lot. 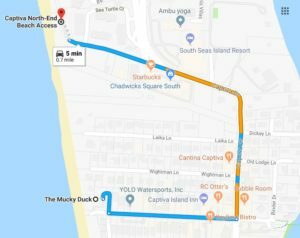 There are no designated shuttles, but you can walk the beach to get back and forth if you like – it’s only about 3 minutes!